In the past, describing any hospitality experience as “robotic” would have seemed like an insult. But as artificial intelligence continues to evolve, the travel industry is finding new and innovative ways to utilize it to better ensure a seamless experience for travelers. In June, JetBlue announced it was implementing AI technology to assist customers with planning the perfect trip. Now, hotels are taking the technology revolution one step further, by employing robots as staff members. CNN Travel recently reported that Singapore’s M Social Hotel — a boutique property from Millennium Hotels that was designed with millennial business travelers in mind — had rolled out a fleet of room service robots for its guests. Known as AURA, the idea behind the new program is based on both efficiency and fun, with the goal of improving the overall guest experience. Lee Richards, Millennium’s VP of Operations, hangs out with AURA at the M Social Hotel. Image courtesy of M Social Singapore’s Facebook page. Though AURA is one of the newest robots on the butler block, he’s not the first. Back in 2014, Aloft — another hotel chain known for being on the bleeding-edge of technology — took a page out of The Jetsons’ book when it debuted Botlr, a three-foot-tall robot butler, at its Aloft Cupertino property (which seems only appropriate). Within a year, the hotel had added a second Botlr — whose main job is assisting with deliveries, including towels and toiletries — as the original mode made the rounds to Aloft outposts across the country. Check out the video below for a closer look at what Botlr can do. In 2016, Savioke — a Santa Clarita, California, start-up intent on seeing its autonomous robot helpers in hotels across the country — got a $15 million infusion of capital to make that goal a reality. The main job of its bot, known as Relay, is also to assist with deliveries. A staff member would simply need to load him up with the requested goodies, punch in the room number and off he’d go, using Wi-Fi and 3D cameras to assist with navigation. Aloft’s Botlr and Savioke’s Relay are, in fact, one in the same. The company supplies its robots to a number of hotels, many of which give their ‘bot a unique moniker, and even special tasks. At the Residence Inn by Marriott on Century Boulevard, located right by LAX, its Saviokie Relay is known as “Wally” and delivers Starbucks coffee as part of his daily duties. The Crowne Plaza San Jose-Silicon Valley, the Grand Hotel in Sunnyvale and the Holiday Inn Express in Redwood City have all had a Relay rolling down their halls, too. Whether these robots will be the room service attendants of the future or simply a fun photo op at tech-savvy properties really depends on who you ask. Last year, Steve Choe — general manager of the luxurious InterContinental Los Angeles Century City — told the Los Angeles Times that one thing still missing from robo-service is that personal touch, a quality people still seek from hotels. But Lynn Mohrfeld, president of the California Hotel and Lodging Association, disagrees. 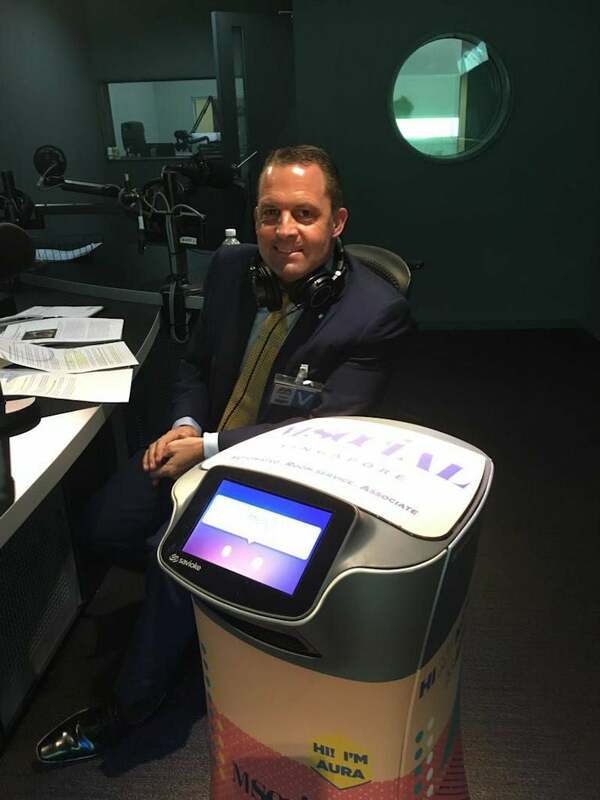 In the same article, he told the Los Angeles Times that while high-end hotel guests may want — and expect — that personal touch, robot helpers could be a boon to hotels that cater to families, millennials and tech-savvy guests. 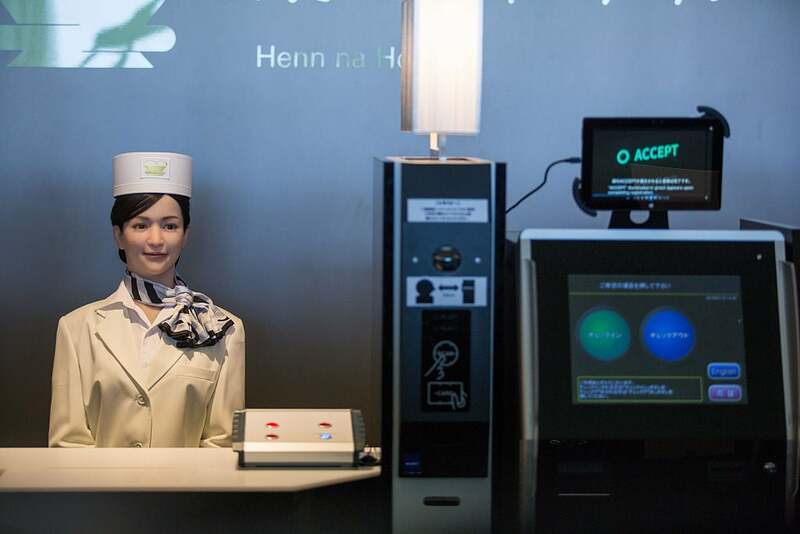 The check-in process at Japan’s Henn na Hotel is completely automated. Photo by Trevor Williams/WireImage/Getty Images. If you’re really willing to hand your hotel experience over to robot, there’s also the Henn na Hotel, a.k.a. the Weird Hotel, in Sasebo, Nagaski, Japan, where automated workers — some of them rather human-looking — will do everything from checking you in to carrying your luggage. The future is now. What do you think? Are you a fan of robot room service? Sound off, below. Featured image courtesy of Aloft Hotels.